Grab a big, big bowl (large enough to fit the 6 cups of cauliflower florets about to go in) and mix the dressing together to start. You need 1/3 cup of tahini paste, 2 tablespoons extra-virgin olive oil, 3/4 teaspoon (or so) of red pepper flakes, and about 2 tablespoons of drained capers. I like to whisk all the ingredients together before adding the capers last so as not to break them up. Not that you need to be scientific about it, but I was doing some research on how many cups of florets you can get from a head of cauliflower. It looks like 1 1/2 cups per pound is the standard rule of thumb but I found that a medium-size head roughly gets you there. Chop the florets fairly small, throw it into the bowl, and toss it well to coat with the tahini dressing. To bake, heat the oven to 475 degrees. If you have a convection option in your oven, use it. I never use the convection for baking desserts but for roasting vegetables, I find it browns the vegetables far more than baking on the regular setting. Spread the cauliflower evenly onto a foil-lined baking sheet lightly greased with baking spray. Roast for about 15 minute, stirring halfway through. When it's done, take it out of the oven, and immediately season it with coarse salt, the juice of half a lemon, and a couple of tablespoons of parsley. Add a little more red pepper flakes, if you like (I do). Since I keep toasted sesame seeds in my cupboard, I sprinkled some of that over top as well. This cauliflower tastes almost luxurious to me. The tahini adds a richness and the coating on the cauliflower gives it a texture that's almost similar to something fried. It's a great side-dish for cauliflower fans. I heated up leftovers the next day and it still tasted fantastic. Preheat oven to 475 degrees (I use the convection mode on my oven). Line a baking sheet with foil and lightly spray foil with cooking spray. In a large bowl, whisk tahini, olive oil, and red pepper flakes together. Gently whisk in the capers. Add cauliflower florets and toss well to coat. Arrange cauliflower in a single layer on the prepared baking sheet. Roast for 15 minutes, stirring about halfway through the time. Remove pan from the oven. Immediately squeeze juice of half a lemon over top. Sprinkle with salt, parsley, and some additional red pepper flakes, if desired. (If you happen to have toasted sesame seeds on hand like I do, sprinkle some over top.) Transfer to a serving platter and serve. I'm printing this right now Monica! I adore tahini and cauliflower so this has my name all over it. I like pure simple vegetables too - and always appreciate an easy recipe to showcase their beautiful taste. Hope you have a magnificent weekend! You absolutely inspired me with your beautiful meatless dishes, Tricia! This was really tasty and easy - I think you'll like it. Have a great one! Hi Monica, there's a shop in the next town that makes their tahini by hand, everyone brings their own container to fill up. They sell it by the pound, it is so delicious. I'm going to try this recipe right away I know it would be a hit. ...and that fresh tahini sounds insane! I would love to be able to get some of that! I wonder if Whole Foods will start a fresh grind for tahini the way they do for nut butters - that might be the best I can get. You know they should, it tastes so much better fresh. Take care! I can't wait to make this, Monica! I love how simple and flavorful it is! I feel the same way and can eat my veggies roasted plain or with some olive oil and salt but am always open to changing it up. Adding tahini, capers and red pepper flakes sounds amazing! I know you make hummus so I'm sure you have some tahini around. The capers is such a great touch in this. It's really easy and tastes great - hope you try and enjoy it, Kelly! Roasted is the only way I eat my veggies!! This looks so good! I love the slight browning from the roasting. Awesome. Totally love roasted veggies! I could easily finished the whole plate!! Cauliflower is the perfect kind of base for this type of dressing, I think. Thanks, Monica. Okay I cannot wait to try this (I also can't stop turning on the oven during the summer! Too many good things come out of it! haha). I've just been roasting cauliflower and drizzling with a tahini sauce so I definitely need to do it this way too! Heat is major ingredient in cooking, isn't it, Ashley! My oven is still going and going day in and day out, too! I'm sure you'd love this - drizzling it with tahini sauce after sounds great, too. Need to try that!! Thanks, Balvinder. I'm glad you like it. I am so with you about it being almost like popcorn. Hard to say why but that's how I feel too! Hehe well we've got the opposite weather so all I feel like doing is turning the oven on! 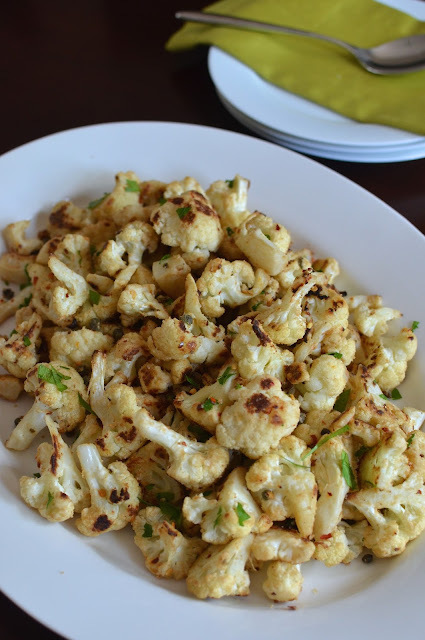 :D We love roasted cauliflower here! I've never met a roasted veggie that I didn't love...and this cauliflower is extra fun with the tahini dressing! I love it! You're a smart lady and always enlighten us with delicious vegetarian recipes, Joanne! Love this cauliflower! Thanks for the recipe! Thanks - have a lovely weekend! 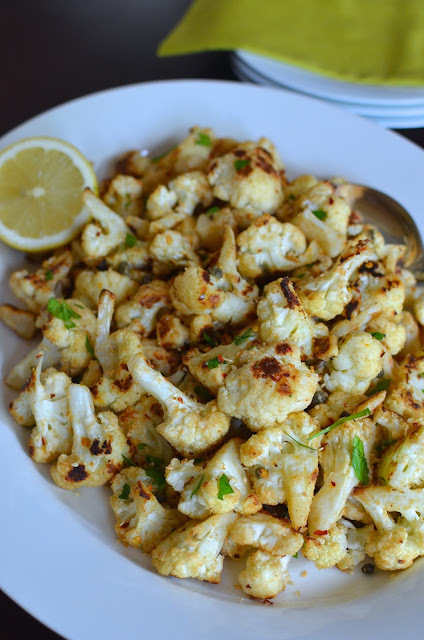 The tahini sauce is a perfect dip for these roasted cauliflower! I'm waiting for the prices of cauliflowers to drop so I can try roasting one myself! This looks absolutely delish! I am taking the inexpensive cauliflower I can get for granted! Hope you enjoy some soon! This sounds divine to me, too. Roasted cauliflower is always great, and these flavours sound terrific. Glad you like it, Beth - it's got a nice flavor and richness to it. I like roasting all summer long...i never even thought about the fact that it most definitely heats up my kitchen. I suppose it's still better than time spent standing over a hot stove though, right? I love cauliflower but my hubby does not, but i feel like maybe he would eat this with all the yummy flavors going on :) I'm like you in that I never think to go beyond the basic olive oil, salt, pepper, especially when roasting. I appreciate your vegetable purity: i'm also a veggie purist, and 99% of the veg that comes from my kitchen is unadorned and i'm cool with that. however: tahini? it's magical, especially on cauliflower! I have a similar recipe, but i like the caper brininess in this, so i'm definitely going to give this a spin.